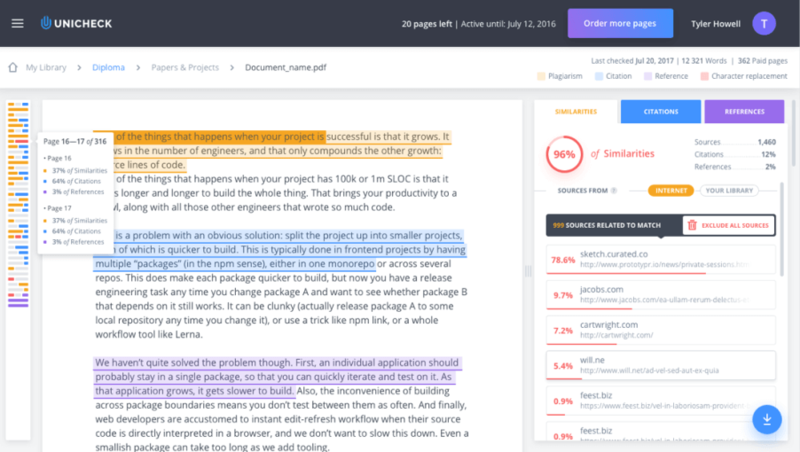 Blog » Can Unicheck Be a New Alternative to Turnitin? A random experiment, held at University of Texas at Austin, has shown that Turnitin only could spot 8 out of 23 plagiarized sources that were harming the inspected document. The search algorithm, as was concluded, has seen no significant improvements since the time it was first launched in 1997. As the new technology needs to be more advanced to project competitiveness on the market, Unicheck started developing the engine that would be precise and swift enough to work with ever-changing web surroundings. Now Unicheck’s searches and compares the sources 4.75+ billion pages real-time. Any broken links or outdated websites stay out of the report, while Unicheck inspects web pages, even those that haven’t been yet cached by the search engines. An overreacting algorithm is not what, supposedly, might serve the teacher the best way during assignment revision, that’s why intelligent search dismisses commonly used phrases, conjunctions, regarding only relevant ones including them in the report. There are similarity checkers that keep and maintain their own database of academic assignments, like Turnitin, and those utilizing the web index like Unicheck. There’s no definitive answer to what approach is better, each one has own benefits. Although Turnitin has collected a giant database of assignments during these 20 years, the search capacities of the Unicheck may even be broader as teacher scans papers across own libraries of assignments, open databases, and web index simultaneously. As for pricing, Unicheck offers substantially better price models in comparison with Turnitin, that charges around $8 per student per year. The “essential” Unicheck package is available for free in the number of countries including US, Australia, Ireland, UK, Canada, New Zealand, and others that found in Unicheck good alternative to Turnitin. While some students accidentally skip acknowledging the sources, others copy paste the excerpts from books or lectures to their notes, word-to-word, then they just forget where the information was taken from. Many plagiarism checkers integrate with Learning Management Systems for seamless work and report generation, but the option of “pre-checks” remains to be an exceptional right of the teacher or instructor to set up. If the option is turned off the student can’t run their assignment through checker to ensure all sources acknowledged before making a final submission. Unicheck has created a similarity checker Google Docs addon that students can use independently, enjoying the actual writing process, instead of worrying about the consequences of being caught with plagiarism, accidental or overlooked. Thinking through the daily routines of educators, Unicheck strives to make their work smooth and comfortable, cut the time of revision, and eliminate the time for trivial daily routines through seamless integration. For Google Classroom, Unicheck so far is a single one plagiarism detection software that performs similarity detection automatically. The process gets triggered just in time a student attaches a submission to the course, all the reports are generating in bulk (due date) or one by one, after that they land on the teacher’s email. Unicheck uses customer feedbacks and suggestions as the basis for constant growth, investigating average teacher’s workflow problems and thinking about all possible resolutions. Unicheck managed to overcome Turnitin’s customer communication gap, caused by the slow mobility, traditionally innate to large companies as they can’t react to changes immediately. Quick-to-react team if developers and technical support are the company’s strongest assets, according to the customer’s feedback, that is always welcomed. Learning and improving is the key of creating a really remarkable educational product, – Unicheck team reports, so in the nearest future, we will witness the release of the solution that will easily identify the paraphrasing and contact cheating as well. Similarity detection software is what can greatly assist the teacher in revising and grading assignments and contribute to the high standards of academic achievement. Unicheck allows students avoid academic dishonesty incidences, knowing all the citing, referencing, and any type of source acknowledgment given is correctly formatted, while educators can be sure of quality and originality of all written assignments. Like every technology, Unicheck is not perfect and has many things on the achievement list to grow up to, nevertheless, it’s already safe to say that today Unicheck is already a good alternative to Turnitin.